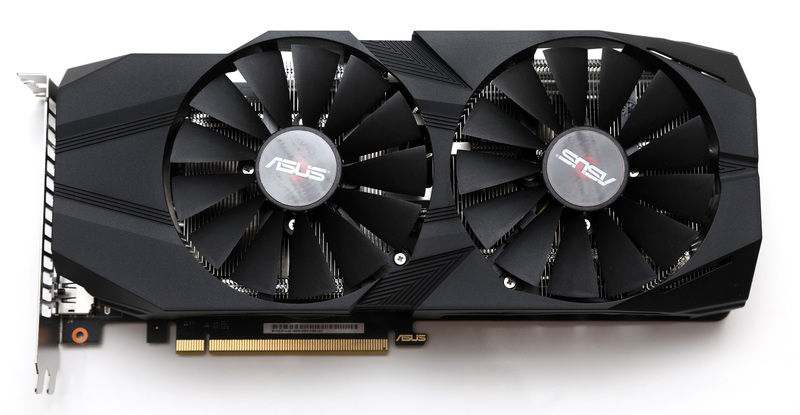 Lately it has been quite hard to get access to or even buy higher-end GPUs used for mining, even at unreasonably high prices it is not always easy, but we finally managed to get our hands on a Nvidia P104-100 based GPU from ASUS to play a bit with it. The new P104-100 is certainly a bit different approach from Nvidia for a mining GPU when compared to the previous version P106-100 that wasn’t much different than a consumer GTX 1060. The new P106-100 is essentially the GPU found inside a GTX 1070, but with a different memory configuration, so it is not essentially a GTX 1070 rebrand with limited warranty and no video outputs. You get 4GB GDDR5X video memory that is apparently optimized for mining with a 256-bit memory bus, finally something done properly on a mining GPU, so you can get better performance in memory dependent algorithms. Of course Nvidia partners like ASUS get to play a bit with the boards and some times they make the rest of the things right, some times they don’t. We are still left with the impressions that when it comes to mining GPUs manufacturers still want to cut on costs and they often do it the wrong way around by messing the things they should not. Typical for ASUS we see a warranty sticker on one of the main screws holding the GPU cooler, but be calm, the board is with just 3 months warranty, so after that you are free to remove it and clean the cooling solution, change the thermal grease or do whatever you want with it. 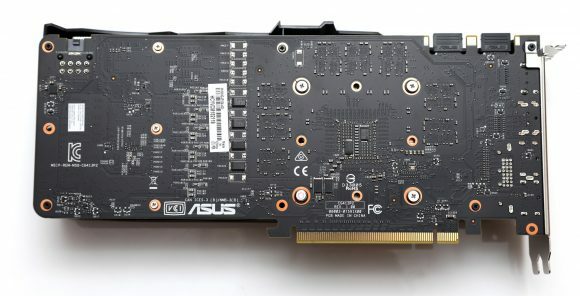 The ASUS Mining P104 4G uses a single 8-pin PCI-E power connector that should be more than enough for the default TDP of 180 Watts for the P104-100. 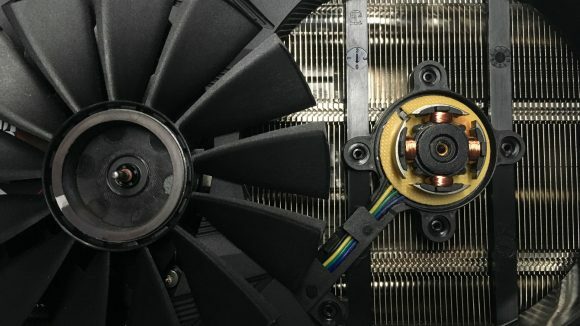 The cooler seems pretty good at first sight and with the dual fans that seem similar to what ASUS uses on their STRIX series the operating temperatures should be fine for mining. Looking a bit closely however things start to get a bit disappointing as it seems that ASUS has decided not to properly cool the memory chips (there is no direct contact with the cooler). Not cooling the video memory properly is definitely a minus here as the chips get pretty hot at stock frequencies and they can be overclocked pretty good, but then get even hotter. As a result from this you might not be able to squeeze the maximum performance you could be able from the particular version of P104-100. Looking at the backplane of the GPU we see that there are no video outputs available, but a closer inspection of the PCB actually shows two connectors present. Surprise, surprise… when you remove the backplane you see that the board actually has a single HDMI and a single DP video outputs onboard, they are just covered by the backplane. Well done ASUS, you could have just opened two holes on the backplane and have these usable anyway, but probably since the idea of the mining GPUs is for them to be used only for mining they decided to cover them. Remember that we’ve mentioned that the cooling fans of the Mining P104 4G GPU look very much like the ones found on the ASUS STRIX series of GPUs for gamers, well they are the same inside as well. Meaning that the fans use bushings instead of ball bearings and that is a no go for a dedicated mining GPU in our opinion! Metal bushings are cheaper, but they do not handle dust and heat as good as ball bearings and in most mining scenarios their usable life is much shorter that what a good ball bearing fan is capable of providing. Guess manufacturers just don’t care what happens with the fans after the 3 months warranty you get is over and most likely the fans will not fail in just 3, but we’ve seen issues starting to appear with these ASUS fans in 4-6 months of use for mining. 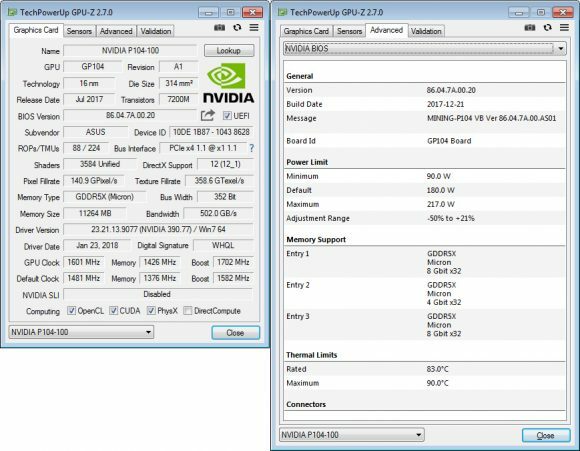 The latest GPU-Z unfortunately does not properly recognize all of the specs of the P104-100 GPU, it confuses the specifications with the ones for a GTX 1080 Ti. The ASUS Mining P104 4G comes with a GPU that has 1920 CUDA Cores running at 1607 MHz base clock, it uses 4GB GDDR5X video memory running at 10010 MHz and has a default TDP of 180 W. One important thing to note here is that the P104-100 is running at x4 PCI-E 1.1, so usability for things other than mining may be limited in terms of performance. The key here is the video memory that is apparently optimized for mining and it has surprisingly good results when it comes to memory intensive algorithms such as Ethereum’s Ethash for example, but more on that in a bit. Here is a quick look at what performance in terms of hashrate you can expect form the ASUS Mining P104 4G GPU at stock frequencies, the benchmark results are with the latest NiceHash Legacy miner covering most of the more popular algorithms at the moment. For GPU-intensive algorithms you can expect to get performance that is similar to that of a GTX 1070, the main advantage that the P104-100 has is in the Ethash algorithm. 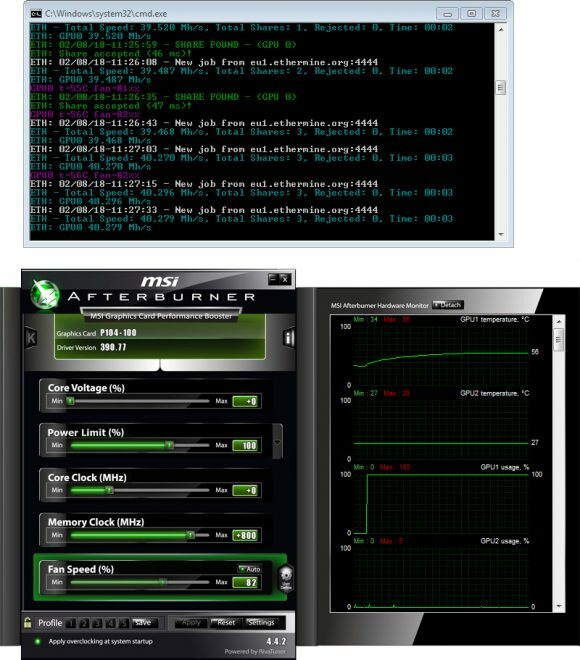 The default performance you can expect to get mining Ethereum or other Ethash-based coins is around 33 MHs at stock settings, but if you start playing with the clocks you can get up to about 40 MHs. 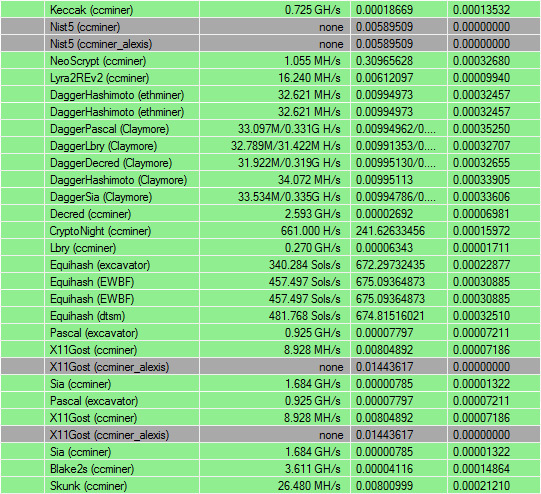 Going right for +800 on the video memory and voila – you get a little over 40 MHS on Ethereum using the Claymore ETH dual miner, but here comes the problem with the video memory getting hot. As already mentioned the memory chips do not have direct contact with the cooler, so they rely on cooling only from the air coming from the fans and they get pretty hot. So running at +800 MHz is a problem for longer time (they might go even higher stable with good cooling), so you have to dial back to about +650 MHz to have stability and you will get down to a little over 39 MHS which is still very good. Especially for mining Ethereum or anything else using Ethash you can lower the power limiter and even the GPU clock, so you can get down to about 135 W of power usage without loss in performance. In the end we get mixed feelings from the ASUS Mining P104 4G GPU, it is performing well, but with some small improvements it could be a much more interesting product. We would like to see dual ball-bearing fans and a cooler that cools the memory chips as well in order to make the card more durable and reliable on the long term as mining is not for just 3 months. Performance wise the P104-100 does great only in Ethereum or other Ethash coins, especially when you overclock the video memory. The results in other more GPU intensive algorithms are not that interesting in particular as the GPU itself is the same as on GTX 1070 and the performance is very much the same. The other not so good thing right now is that there is limited availability even for the P104-100 mining GPUs and if you manage to find them somewhere their prices are also higher than usual, just like is the case with the regular GeForce gaming GPUs form Nvidia at the moment.